Sweating over last-minute favor needs for your baby shower occasion? Don’t fret—check out these baby shower favor ideas that are pre-packaged and ready to go! 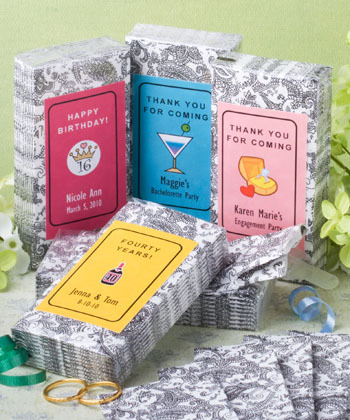 Personalized Expressions Collection Tissues Favors—These tissue favors are ready to go the minute they arrive at your doorstep, and they’re especially nice because they offer you the option to customize them with special text and graphics to make your favors more personal. You can count on these travel-size tissues to be decorative for your shower and practical for your guests. 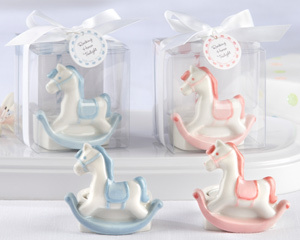 “Rock-a-Bye Carousel” Ceramic Rocking Horse Tealight Holder—This tea light holder is another one of the many baby shower favor ideas that are pre-packaged and ready to go for a last-minute shower. With baby blue or pink color options, these holders are presented in clear boxes with decorative white ribbons and require no additional assembly effort on your part. 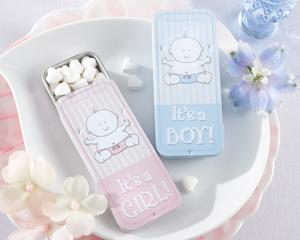 “It’s a Boy” & “It’s a Girl” Slide Mint Tin Favors (Pink and Blue)—Quick and convenient are just a few qualities to expect from these mint tin favors. They also offer style and practicality, and they can accommodate your shower needs whether you’re expecting a boy or a girl. 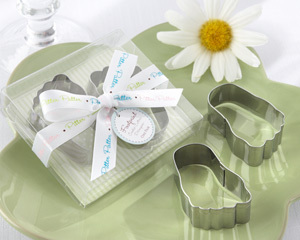 “Pitter-Patter of Little Feet” Stainless-Steel Baby Footprint Cookie Cutters—If you want something thoughtful and unique, this cookie cutter set is one of the best pre-packaged baby shower favor ideas to choose from, and its presentation makes it ideal for adding a touch of innocence and style to your place settings. Make the shower decorating and gifting process easy with any of these pre-packaged baby favors. This entry was posted in Affordable Baby Favors, Animal Baby Favors, Edible Baby Favors, Popular Baby Favors, Practical Baby Favors, Unique Baby Favors and tagged baby favor ideas, baby favor tins, baby favors, candle baby favors, ceramic baby favors, edible baby favors, kitchen baby favors, personalized baby favors, practical baby favors. Bookmark the permalink.